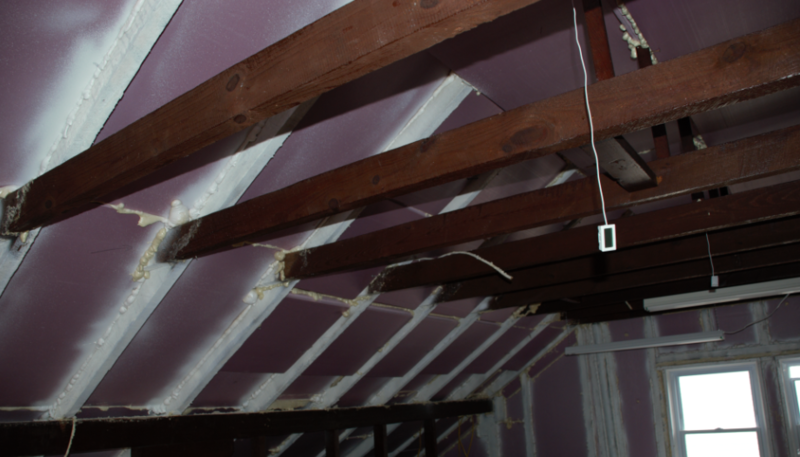 My dear DIY friends, in this article I want to share with you a spray foam alternative and how to insulate your upper floor or attic using XPS (Extruded Polystyrene) insulation to achieve the same performance as closed cell spray foam insulation. Rather than poison your family and house with spray foam gases and lingering odors (don’t believe your installer when he says ‘it won’t smell’…) you can easily and cheaply do it yourself with good results. 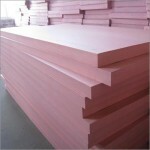 Ask five companies for a quote and you’ll get a huge price range for the same material and job. I got two spray foam jobs done, luckily they are in well ventilated areas outdoors. AND IT STANK for three years like rotten fish! So there’s no way I would want to risk my health putting this crap inside my house. Spray foam is not only unhealthy it’s also a rip off. XPS is likely cheaper if you do not add your own labor to the equation. The main reason I went with XPS is the odor risk. I wanted a 100% odor free install. Something that no installer was willing to guarantee. And despite what many people told me, XPS works very well for this purpose! Closed Cell Foam is a great insulator, but has drawbacks, too. XPS is great for the attic but there are some things you need to know before getting started. In my example below, I used XPS right under the roof deck for a cathedral-type of ceiling. If you don’t intend to finish your attic, you could put the XPS sheets on the floor instead. That’s way easier, faster, and cheaper that doing it the way I did; however, finishing the attic gives you so much more space! You may find this article useful, too: XPS (Extruded Polystyrene) versus Fiberglass Insulation: Is it Better? The work-in-progress above shows how the installation works in principle. Cut the XPS boards 1″ shorter between the roof joists, i.e. leave a 1″ gap around the board, at least 1/2″. Ideally leave a 1″ gap behind the roof deck as well for ventilation. Use screws to fix the board until it’s sprayed in place. All the way up you need to leave the top of the top-most sheet open. On the first hot day of the year, this is where the winter moisture will escape from. Note that my 1928 house doesn’t have soffit or ridge vents, but has gable vents. If you look closely at the top you’ll see I built an XPS tunnel going from north to south, connecting the two gable vents and this pathway provides an exit path for moisture. Finish one roof joist and use the black Great Stuff can (closed cell canned spray foam) to spray around the sheet. This spray creates a good airtight seal. You could do two sheets in one go and finish 4″ R20 in one pass. Estimated costs per sq ft for R20: $1.25 + 20% waste + $.15 caned foam = $1.65 per sq foot based on $20/2″ sheet 8’x2′ and $5/can and one can per sheet area. At the end put a 6mil vapor barrier over everything and be sure to buy one with flame retardant. Home Crappo sells them online only, which is interesting. If you put regular 6 mil on fire, it burns like gasoline. You wouldn’t want that near electric wiring. How Much R-Value do I Need? Extruded polystyrene is very different from fiberglass, see: XPS (Extruded Polystyrene) versus Fiberglass Insulation: Is it Better? In the DC metro area, which is a mixed cold-hot-humid, they recommend a really big R value, which from my experience with the above installation is not necessary at all. Actually a single R10 sheet in the ceiling is sufficient. Double that to R20 with 4″ XPS and it’s perfect. No fiberglass install can compete with this, given the many advantages of XPS over fiberglass other than price. In walls here in the DC area, a single 2″ sheet leads to perfect results. My heating and cooling bills are low so I think XPS was a great alternative and does a good job, without the chemical smell (and risk) of spray foam insulation and without the mold potential and other disadvantages of fiberglass. In addition, this insulation doesn’t take up much space either. I’m not a full time insulation guy. In my free time I renovate and it’s quite fun and a wonderful learning experience. My work life revolves around improving Hyper-V backup products with cloud backup and other related features.